So I've been trawling the web looking for some Christmas bargains and boy have I found some!! I actually need them all! There's some absolute corkers out there and I've picked my top 10 favourites for £30 and under for you to enjoy. Men - listen up! - A multipurpose '5-minute beauty' face palette containing a highlighter, blusher and 2 eyeshadows. - This is an absolute STEAL. I've heard and read so many rave reviews about this hair styler, and to find that it's only £17.99 in Home Bargains is like a dream considering it's £59.99 in Boots and Superdrug and £35 on Amazon. I've already grabbed one and put it away for Christmas off my Mother in Law as I couldn't believe the bargain! Woop! - Another beauty bargain. Real Techniques brushes have got to be the best and most popular on the High Street. After the success of Sam's Picks, Nic has now brought her own limited edition set out which includes 5 brushes. A bargain at £20 considering it's £30 in Boots. 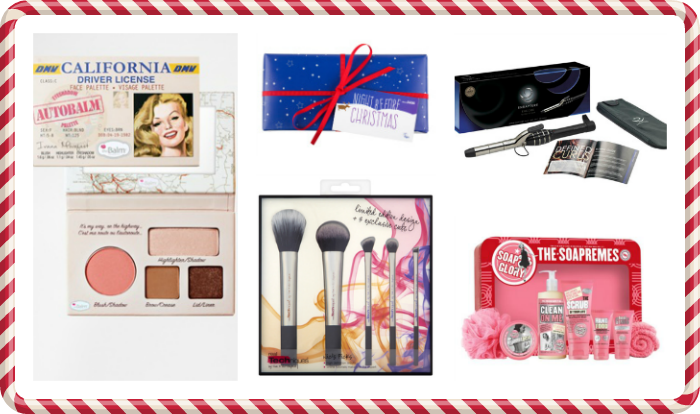 - It wouldn't be a gift guide if Soap & Glory wasn't included. This set is in the Boots 3 for 2 and includes; Clean on Me Shower Gel, The Righteous Butter, The Scrub of Your Life, Hand Food, Heel Genius, Cosy Socks & Body Polisher. A lovely set for the price. - Contains 4 of Urban Decay's ever so popular double-ended eye pencils. I've added an * to the price as it retails at £27 but is currently £24.30 in the Debenhams 10% off beauty event. - This extremely popular eyeshadow palette consists of 12 neutral eyeshadows with a mix of mattes and shimmers. An ideal gift! - My personal favourite from the whole gift guide (and something I might have just spent my Boots points on - woooops). For the first time ever, Benefit's boxed blushers are all together in one gift set for AMAZING value. The set includes; Dandelion, Sugarbomb, Coralista, Bella Bamba, Hoola, Rockateur & a mini Watt's Up Highlighter. The blushers and bronzer come in at 5g of product, and I think the full sizes when bought seperately are 8g, apart from Rockateur which is actually 5g when you buy it alone and that costs they cost £23.50. How amazing is that! Not only that, it comes in the cutest tin to keep them safe. Loving it! - As the title suggest, this ultimate beauty kit contains an amazing 40 Eyeshadows, 6 Highlighters and 6 Blushers. I think this would make a great starter kit or even a great travel item. I haven't tried any makeup by Pixi before so I'm not sure how they are in terms of pigmentation, but it looks a great value set. - Gotta love a bit of Origins. 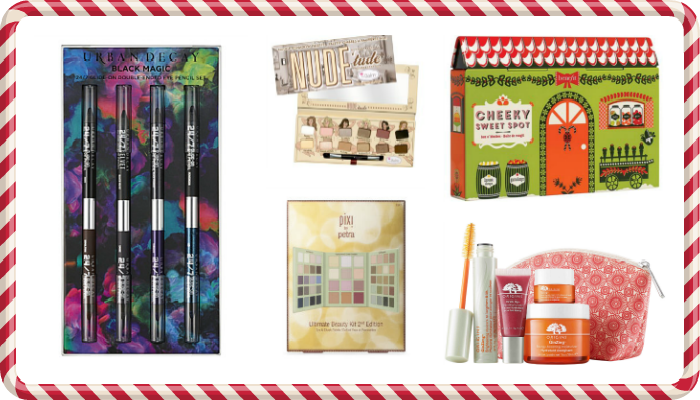 They're just fantastic when it comes to skincare, and this gift set looks like a great mix of skincare and makeup at decent value. The set includes; GinZing Brightening Mascara, GinZing Energy-Boosting Moisturiser, Ginzing Refreshing Eye Cream & Drink Up Hydrating Lip Balm. Oooooh I'm really in the mood for Christmas now! What are your ultimate beauty picks for this year?